Who is Mutual and Federal? 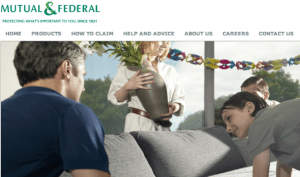 Mutual and Federal is one of the oldest short term insurance providers in South Africa, whose history goes back about 180 years (according to the M & F website). Back in 1831, Mutual and Federal’s forerunner, the “South African Fire and Life Assurance Company” was established. As political and economic changes occurred in South Africa primarily in the 1960s, Mutual and Federal began its several stages of merging with Old Mutual until Mutual and Federal became a fully owned subsidiary of the Old Mutual Group in 2010. With approximately 2300 employees, Mutual and Federal is headed by Chairman, Mike Harper, and CEO, Raimund Snyders. According to their website, they operate with the following values: accountability, respect, pushing beyond boundaries, integrity and passion. In addition to their regular insurance services, Mutual and Federal are also involved in a variety of social investment programs focusing primarily on education and agricultural socio-economic development. Where is Mutual and Federal located? Mutual and Federal’s corporate business office is located at Peermont House, 152 Branston Drive, Bryanston 2021. Their postal address is P.O. Box 3909, Randburg 2125. What makes Mutual and Federal different? Mutual and Federal offers personal, business and farmers insurance solutions. What do we mean by “solutions?” Well, they don’t provide the actual insurance product but rather they act as brokers, as middlemen who are proficient at locating the best insurance solutions for your particular needs. So, if you are looking for insurance, and after you of course already compared a few online insurance quotes (by using our online form here below), you would then call them and explain the particulars of what type of insurance you are looking for. The Mutual and Federal brokers would then give you several options, explaining the differences and help you figure out what best suits your needs. Once you decide, the Mutual and Federal broker will sign you up and continue to be your contact person for your insurance needs. The actual insurance policy would be from one of the many insurance companies in South-Africa. What services does Mutual and Federal offer? In terms of personal insurance solutions, Mutual and Federal provide access to both car insurance and home insurance. Let’s take a closer look at Mutual and Federal’s options for car insurance: insurance through a dedicated broker with surewise or direct insurance with iWYZE (offered through their parent company, Old Mutual). Surewise: With this option, your personal broker from Mutual and Federal will sign you up with surewise who will provide you with the short-term insurance. Under their vehicle insurance, they have three options: comprehensive car insurance, third party car insurance, fire and theft and third party only. The Comprehensive car insurance gives the widest coverage and covers your car against accidents, fire and theft, as well as third party claims if you are the one liable for damages. The third party, fire and theft insurance covers your car against fire, theft and third party claims, but does not cover you for accidents. The third party only covers you for third party claims if you are the one liable for damages or injury. Named driver cover – If you limit coverage to two specific drivers you can reduce your premiums. Courtesy car – You are entitled to a courtesy car after an accident or theft while surewise figures out the next step. Credit shortfall cover – Surewise will pay the outstanding balance on a financed car if it is stolen or written-off. Additional benefits package – These include coverage for limited medical expenses for passengers, trauma counseling, emergency hotel expenses and key/remote replacement costs. We personally feel that at least some of these ‘added benefits’ aren’t really added benefits due to the fact that most of the other insurance companies offer them anyway. Thus for example, it is kind of obvious that there is a discount for named drivers, seeing how less drivers is less risk for the insurance company. iWYZE: Insuring directly through iWYZE (Old Mutual), they offer the same three coverage options as surewise – comprehensive, third party, fire and theft and third party only (see above for explanation of these coverage options). Additionally, the benefits outlined above are similarly available if you insure your vehicle through iWYZE. So, you may ask yourself, what is the difference – the coverage and benefits seem identical? Why would I choose one of these over the other? What does one offer me that the other does not? Great questions. We believe the answer lies in the broker. If you insure with surewise, you then deal directly with a broker from Mutual and Federal. If you insure directly through iWYZE, you are dealing with any of the iWYZA representatives. In other words, with surewise, you will have a personal relationship with your broker, whereas with iWYZE you will be dealing with any of their random representatives when you contact them. How user-friendly is the Mutual and Federal website? The Mutual and Federal website looks very professional and detailed. As you click your way through their website, the information you find is relevant and very thorough. This is true for their products, as well as the company’s history and profile. Whether it is their brokerage services or other services they offer, the information is laid out and outlined in a way that makes it easy to follow. This also makes it easy to find what you are looking for as a potential customer, including their link that tells you how to file a claim. So, overall Mutual and Federal’s website was easy to navigate, intuitive to use and informative – we give it a thumbs up! What are the customer reviews of Mutual and Federal? In reviewing the hellopeter website, Mutual and Federal received just under 300 reports over the past 12 months. Of those reports, only 15% were compliments, while 85% were complaints. That’s about 5 times more complaints than compliments which is not good compared to other insurance company ratings! When looking at the nature of the complaints, they received the highest number of complaints in the “feedback/response” category. This seems to indicate quite a number of customers dissatisfied with customer service related issues. To Mutual and Federal’s credit, they did provide a response to every complaint and compliment, perhaps alluding to their desire to resolve issues with their customers. With its long standing history, Mutual and Federal has gone through a lot of changes. However, they have withstood the test of time and continue to provide short-term insurance solutions to the South African community. Although Mutual and Federal are primarily insurance brokers, and not direct insurers, one could say that the main benefit of this is that you have someone who can help you navigate the options and be your advocate (hoping this is true). On the other side of things, looking at the number of complaints versus compliments on hellopeter, one might be hesitant to use a broker through Mutual and Federal. However, because they are brokers, it is important to determine if the complaints relate to one’s experience with Mutual and Federal or with the insurance product solutions they are offering – although, if they receive too many complaints about the insurance product, shouldn’t one expect them to change the product? Once again, the key is to do your research, compare online car insurance quotes and speak with others about their experience.